Do you remember the pink tubs, toilets and sinks from the 1960s? Powder blue 4-inch walls tiles from the 1970s? White laminate cabinets from the 1980s? Sliding door shower enclosures from the 1990s? Bathroom design trends seem to change every ten years or so. There are always new products arriving on the market and new ideas about how to create comfort in this personal space. Each year the National Kitchen and Bath Association (NKBA) surveys 300 member interior designers (among its 60,000 members in North America) for their thoughts about trending products, design styles and materials they are using with their customers. NKBA publishes the findings of the survey for both people in the industry and consumers to learn about what is trending in home design. In 2013, designers are favoring transitional design style in baths, gray walls, satin nickel finishes on hardware and quartz counters. We are seeing some of these trends in the Greater Cincinnati area but we’re also seeing other trends as well. 1. Transitional styling. What is transitional interior design style? It is a combination of traditional and contemporary architectural elements and furnishings. In a bathroom it can mean contemporary tiles and plumbing fixtures combined with traditional Shaker or Mission-style cabinetry and crystal lighting fixtures. Lines are clean, furnishings are carefully selected and minimal, and walls and flooring are used as a neutral background to accentuate the elements. 2. Quartz. Quartz has steadily been gaining in popularity as a counter surface. New designs look like marble and granite but quartz is more durable, less porous, not susceptible to staining and easy to maintain. Designers are finding other uses for quartz surfacing in bathrooms such as a surround for a shower or tub, sink backsplash, shower bench or an accent with flooring. 3. Tile. NKBA designers noted the continued popularity of ceramic and porcelain tile in bathrooms. Natural stone tile remains second in the survey. Many of our customers choose white or neutral beige and brown tiles for their projects. Some also are opting for wood flooring in their bathrooms. 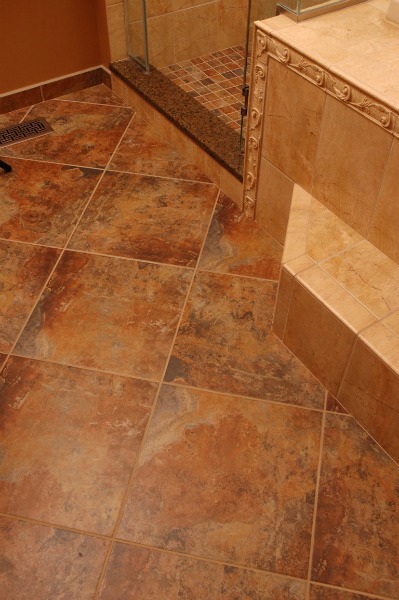 When selecting floor tile, it’s important to look for non-slip tile. Glass mosaic tile is also popular and is often used as an accent in today’s bathrooms. 4. Sinks. More designers and homeowners favor undermount sinks because of the clean look when installed with a vanity surface, especially granite, marble or quartz, and the ease of maintenance. 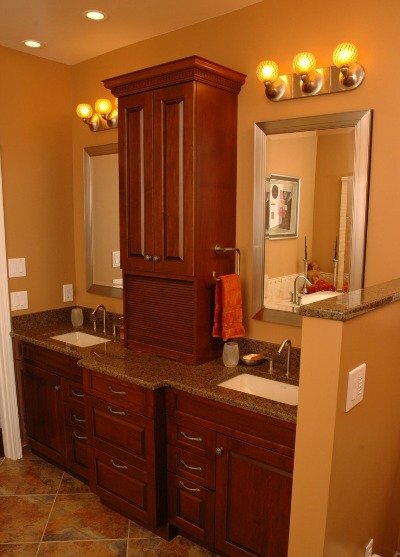 Integrated sinks ranked second in the NKBA survey and more designers are using them in 2013. Vessel sinks are still a hot trend, particularly in half baths and powder rooms where homeowners enjoy adding upscale elements to a small space. 5. Touchless faucets. More of our customers are selecting touchless faucets for both kitchen and bath remodeling projects. They like the modern convenience, streamlined look and the fact that these faucets limit the spread of bacteria and viruses. 6. Neutral colors. NKBA designers are using gray wall colors more frequently in their projects but whites and off-whites ranked first in the survey, followed by beiges, then gray and brown. Many homeowners use white or beige tiles and will add a favorite color to a bathroom wall as an accent. Bright colors that work well with white or neutral tiles include light and deep blue, teal, gold, apple green and reds. Wall color can be changed easily as trends change. 7. Layered lighting. Lighting is important in a bathroom for both function and ambience. Layered lighting refers to the illumination provided by ceiling lights, wall and mirror lights, shower lights, cabinet lights, uplights and downlights. Natural light should also be considered in mapping lighting for a room. In spa-like baths, pendant lighting is often used and lights may be installed with dimmer switches. 8. Low-flow or dual flush toilets. In the construction industry there has been a growing interest in green technologies over the past decade. Consumers are also interested in environmentally friendly products that help to conserve natural resources such as energy, wood and water. Toilet manufacturers are designing products in response to this demand. Low-flow toilets use less water than traditional toilets. Dual flush toilets have a button for disposing of liquid waste and a button for solid waste. These toilets use even less water. 9. Tubs. New tub designs add both comfort and elegance to a bathroom. 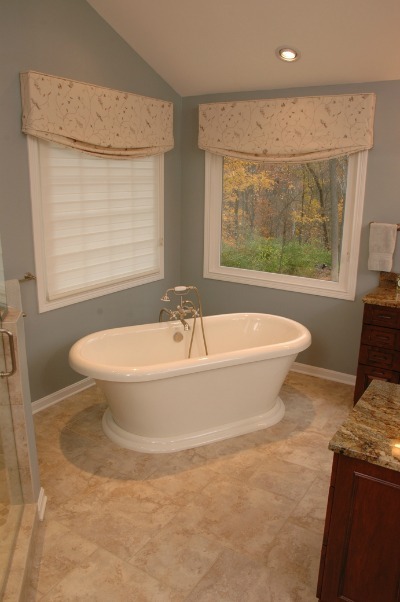 Freestanding tubs are a hot item because of the architectural interest they add to a bathroom. However, drop-in tubs with surrounds and corner-tubs that optimize space are also trends that will endure over time. 10. Walk-in showers. 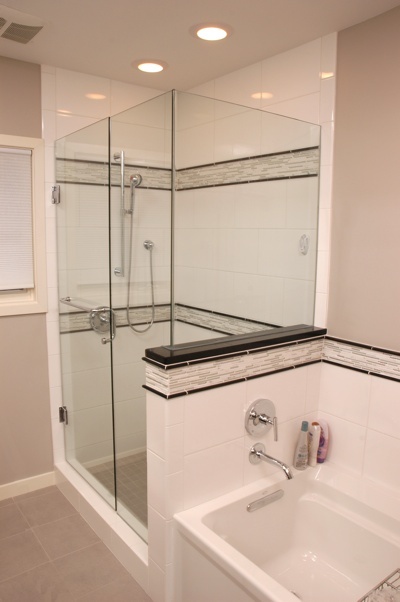 The NKBA survey did not address the growing popularity of walk-in showers. With busy lifestyles, most people enjoy a good shower. 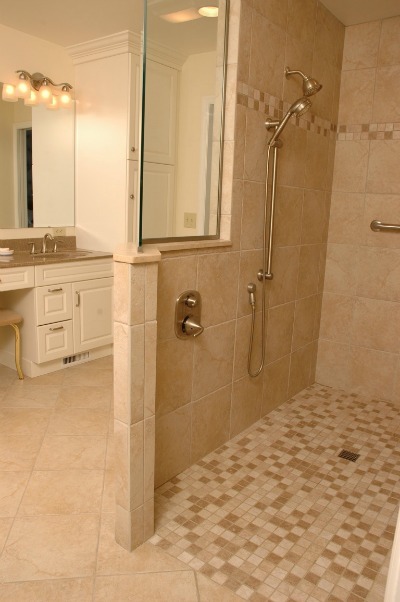 New construction often features bathrooms with curbless walk-in showers or walk-in showers without doors. Multiple showerheads are also a hot trend. Homeowners who remodel are also seeking these features to make their bathrooms safer and more functional.